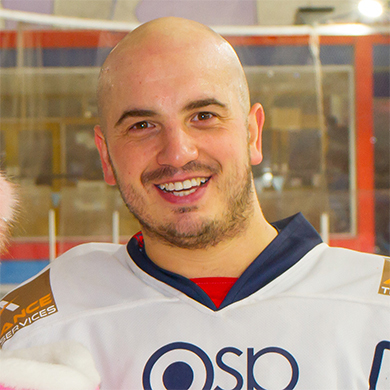 Anthony Leone is far from a stranger at Planet Ice in Gillingham having already made 302 appearances for the Dynamos and amassed enough goals and assists to become the club’s 11th highest all time points’ scorer. He first pulled on a Mos jersey in 2006 having arrived in Kent following several years in the league above – in what was then the EPL – with the Romford Raiders and Chelmsford Chieftains. He would stay with the Dynamos for four consecutive terms and made his mark with 120 points from 153 appearances – 62 of those as he found the net and 58 as he teed up others in front of goal. His input helped the club claim three Southern Championships and a National Title. In 2010 Anthony Leone then began a two year stint with the Romford Raiders where he continued to get amongst the points with 116 from 80 fixtures. He captained the side to a third place finish in his first term but then guided the Essex outfit to the summit of the NIHL South Division1 in 2011/12 to maintain his habit of lifting silverware. Hot on the heels of his league success, Anthony Leone returned to Kent in the summer of 2012 beginning another three year spell with the Dynamos. Back in Gillingham he played a further 146 games for the Mos, tallied 67 goals and claimed 69 assists for 136 points. The number 29 wore the ‘C’ of captain for the last two of those three seasons and lifted another trophy as the club claimed the NIHL Southern Cup in 2014/15. Leone was on the move again the following summer as he was drawn back to the Chelmsford Chieftains where he had last played in 2006. He remained with the Essex club for their final two years in the NIHL South’s top tier – scoring 23 goals and playing a role in 36 more for 59 points in 89 games. In his first season back, the Chieftains secured league, cup, southeast trophy and playoff success before going on to claim the league championship again in 2016/17. Last term Chelmsford opted to drop to the NIHL South Division 2 and Leone loyally stayed with them – continuing to captain the side and scoring 21 goals, adding 24 assists and so amassing 45 points in 28 fixtures. However now the forward returns both to the league’s top tier and to the Dynamos where he has already played 302 games, fired in 132 goals, had a role in 128 more and so secured 260 points. “Anthony is no stranger to the club having already spent seven seasons with us and played over 300 games in a Mos jersey. He’s a strong forward but just as important is that he’s a fantastic motivator both on and off the ice. He’s the finest captain I have worked with in my time as a coach and I’ve no hesitation in giving him the ‘C’ once again for 2018/19. Anthony has been captain at every club he has played for and it’s no coincidence that all of those sides have enjoyed success. His leadership, experience, physical edge and ability to put the puck in the net will be invaluable for us as we look to be more competitive in the NIHL South Division 1 next term”.